Late in the day on 28 February, as shown above, GOES-R IFR Probability fields included a small region of enhancement over west-central Arkansas and east-central Oklahoma. In this case, that field heralded the development of more widespread IFR conditions over northeast Texas (and surroundings). By 0300 on 29 February, below, IFR probailities in the region over east-central Oklahoma/west-central Arkansas had increased, and there is a suggestion of increasing IFR Probabilities over northeast Texas as well. This is a case where IFR Probabilities can alert a forecaster to pay attention to a region long before a hazard develops. Late February starts the time when GOES-13 is near enough to eclipse season that stray light can creep into imagery. In this case, a large signal increase between 0500 and 0515, below, is in part related to stray light, and in part to low cloud development. 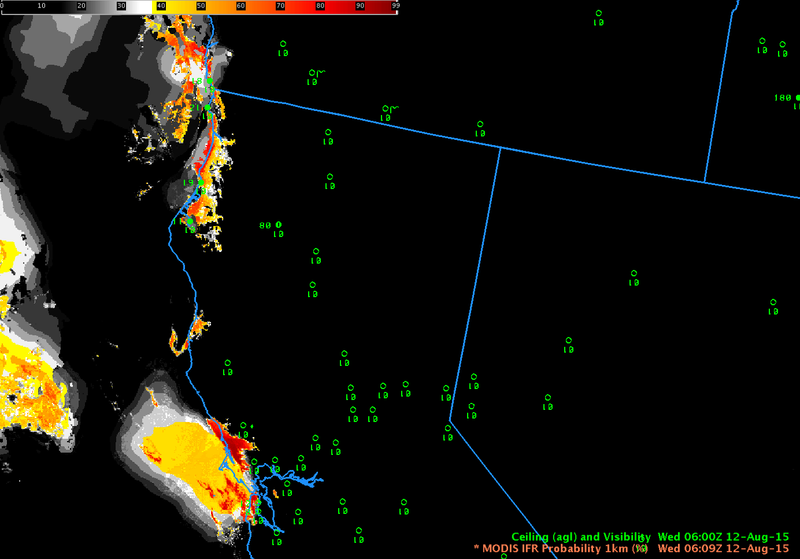 By 0530, IFR Probability fields show less affect from stray light. (Click here for an animation of brightness temperature difference fields alone; Stray Light has an obvious impact at 0515 UTC). IFR Probability fields from 0615 through 1215 UTC are shown below. Very high IFR Probabilities (and IFR conditions) were widespread in the early morning over northeast Texas and surrounding states. This entry was posted in Deep South, Plains, Stray Light on February 29, 2016 by Scott Lindstrom. 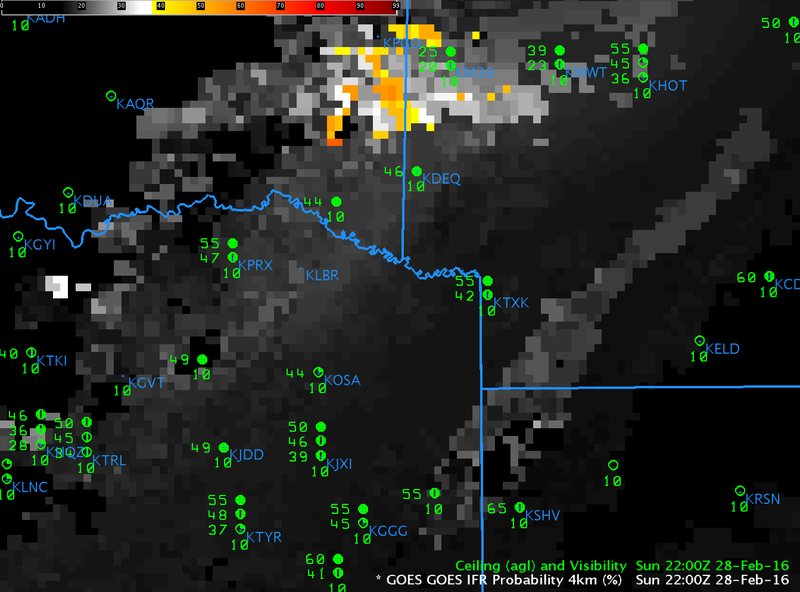 GOES-R IFR Probability fields, above, suggest IFR conditions are developing over central Nebraska during the early morning of 18 August 2015. Several aspects of the field require comment. At the beginning of the animation, there are noticeable north-south oriented lines in the IFR and Low-IFR Probability fields. 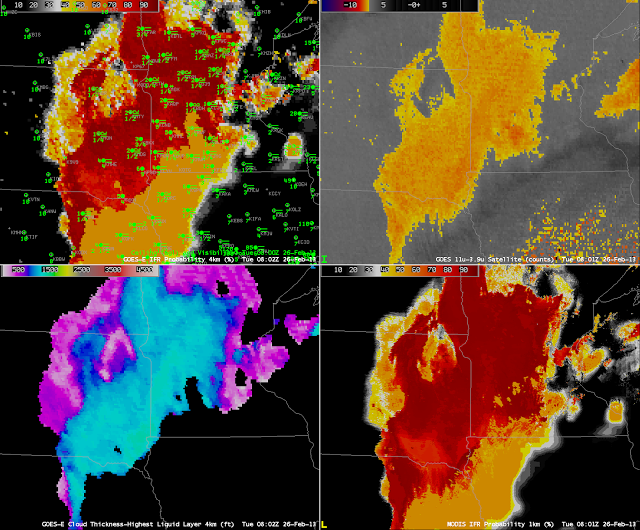 These are artifacts of determining the saturation in the lowest 1000 feet of the model as discussed here. As the model saturation deepened over the course of the night, those parallel lines disappeared. The flat nature of the field announces that satellite data are not being used in the computation of IFR Probability because multiple cloud layers are present. Model fields lack the fine spatial resolution of GOES Satellite data. Where breaks in the clouds do occur, GOES-R IFR Probability fields increase in value (because cloud predictors can be used, and their use enhances the ability of the algorithm to predict whether fog/low clouds are present): Temper your interpretation of the magnitude of the IFR Probability with knowledge of presence of clouds. Note that the Brightness Temperature Difference field at 0500 UTC has much larger values. Stray Light is beginning to impinge on satellite fields as the calendar gets closer to the Equinox. This issue will remain through mid-October. Multiple cloud decks over Nebraska on 18 August greatly hampered the ability of the brightness temperature difference field to identify regions of low clouds. The GOES-R Cloud Thickness fields are displayed; these are derived from an empirical relationship between 3.9 µm emmissivity and cloud thickness derived from SODAR data off the west coast of the United States. When multiple cloud layers are present, this field is not computed (nor is it displayed around sunrise/sunset). Thus, you should not see Cloud Thickness fields in regions where GOES-R IFR Probability fields are very smooth (suggesting that only model data are being used). The regions where Cloud Thickness is displayed, above, correspond to regions in the IFR Probability field that are pixelated (that is, where satellite data are being used). Fog formation is aided by increasingly long nights. Nights now are above 90 minutes longer in Hastings than they were at the Summer Solstice. ADVISORY...WHICH IS IN EFFECT UNTIL 9 AM CDT THIS MORNING. HELP TO GRADUALLY IMPROVE DENSE FOG ISSUES. PREPARE FOR RAPID CHANGES IN VISIBILITY OVER SHORT DISTANCES. This entry was posted in Plains, Stray Light on August 18, 2015 by Scott Lindstrom. Suomi NPP data from 1003 UTC on 12 August, above, shows evidence of a cloud bank hugging the northern California coast from Cape Mendocino to San Francisco Bay. It also penetrates inland to Santa Rosa in Sonoma County. (Note also how the fires burning in interior show up well in the Day Night Band — they are emitting visible light — and in the Brightness Temperature Difference band — because they are much warmer in the 3.74 µm image than in the 11.45 µm image). MODIS can give high-resolution imagery, but the infrequency of the scenes tempers its usefulness. In contrast, GOES-15 (as GOES-West) views the California coast every 15 minutes, and this excellent temporal resolution (that will improve in the GOES-R era) allows a better monitoring of the evolution of coastal fog. Hourly plots of GOES-R IFR Probability, below, computed from GOES-15 and Rapid Refresh Data show the slow increase in GOES-R IFR Probabilities along the coast as ceilings and visibilities drop. In the animation above, note the general increase in GOES-R IFR probabilities at 0900 UTC relative to 0800 and 1000 UTC. We are close enough to the Solstice that Stray Light Issues are starting. The 0800, 0900 and 1000 UTC brightness temperature difference imagery, below, shows the large signal increase at 0900 UTC that can be attributed to stray light. GOES-R IFR Probabilities can tone down that increase somewhat — because the model data will now show low-level saturation in regions where stray light erroneously suggests low clouds/fog might exist. GOES-R IFR Probabilities also screen out the constant fog signal over the Central Valley of California (and over Nevada) that is driven not by the presence of low clouds but by soil emissivity differences. ======================== Added =========================GOES-14 in SRSO-R mode (see also this link) viewed the west coast starting at 1115 UTC today. The Brightness Temperature Difference field, below, (click here for mp4) shows the slow expansion/evaporation of the low stratus/fog. 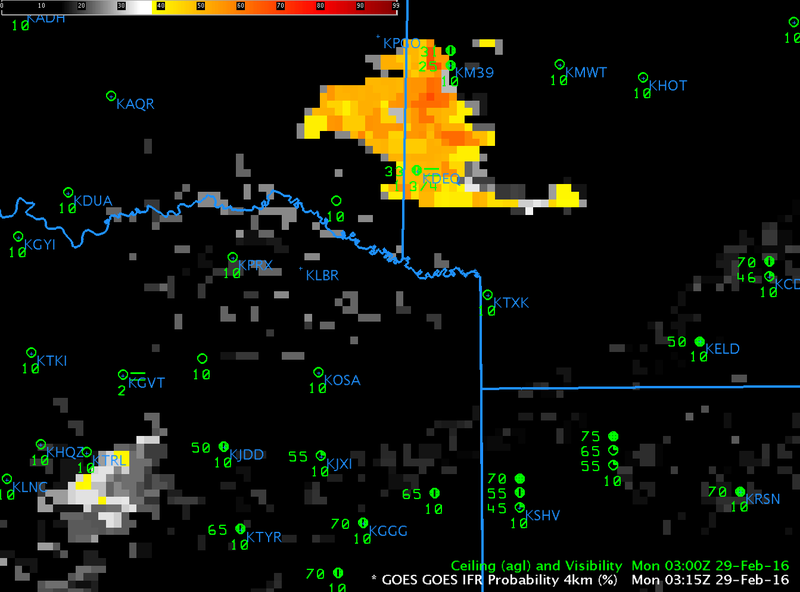 (GOES-R IFR Probabilities were not computed with the GOES-14 1-minute imagery). The rapid change in the field at sunrise occurs because solar radiation at 3.9 µm quickly changes the brightness temperature difference from negative to positive. 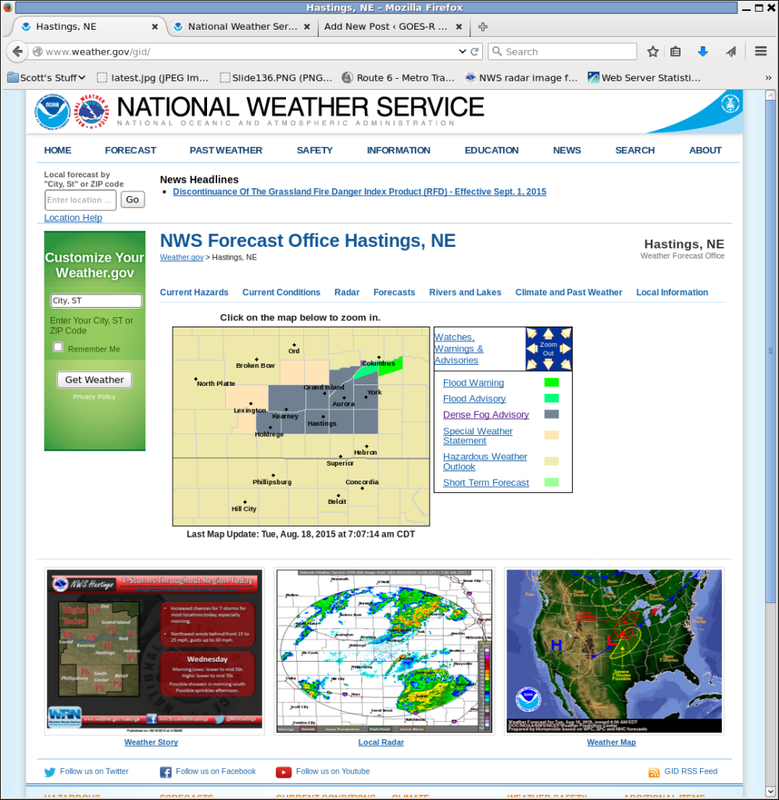 Visible Imagery is below (Click here for mp4). This entry was posted in California, Day/Night Band, Emissivity, MODIS, Stray Light on August 12, 2015 by Scott Lindstrom. GOES-R IFR Probabilities (Upper Left), GOES-West Brightness Temperature Difference (10.7 µm – 3.9 µm) (Upper Right), Topography (Lower Left), GOES-West Water Vapor Imagery (6.7 µm) (Lower Left), hourly from 0400 through 1700 UTC 20 March 2013. The animation above of the Fog/Low Stratus and Brightness Temperature difference highlights the difficulty that the traditional brightness temperature difference product encounters when multiple cloud layers are present, as you might expect to be present given the water vapor imagery. At the beginning of the animation, highest IFR probabilities exist over the elevated terrain that surrounds the Willamette Valley in Oregon. There were also high probabilities off shore. As the frontal region moves onshore, IFR probabilities increase on shore. Note also how the GOES-R IFR Probability field is a more coherent one whereas the traditional brightness temperature difference field from GOES contains many separate areas of return that make it harder to see the big picture. The brightness temperature difference also suffers from stray light contamination at 1000 UTC — but that contamination does not propagate into the GOES-R IFR probability field. The imagery above shows how straylight contamination in the shortwave IR (3.9 µm) can influence the brightness temperature difference. The GOES imagery shows the effects (just at this 1000 UTC image, which is also included in the animation above), but that ‘contamination’ does not propagate strongly into the GOES-R IFR Probability. Note also that the Suomi/NPP Brightness Temperature Difference shows none of the stray light contamination. Lunar illumination allows the nighttime visualization of the clouds off the west coast of the US. As this frontal band moves over Oregon, reduced visibilities result, but only the GOES-R IFR probabilities accurately capture the location of the frontal band because of the multiple cloud layers that exist. This entry was posted in Day/Night Band, Multiple Cloud Layers, Pacific Northwest, Stray Light, Suomi/NPP, Terrain on March 20, 2013 by Scott Lindstrom. Hourly imagery of GOES-R IFR Probability from the overnight/early morning of 14 March 2013 shows the typical advance inland of stratus along coastal southern California. Several aspects of this loop bear mention. In the 0200 UTC, the division between daytime predictors (to the left) and nighttime predictors (to the right) is evident extending mostly north-south over the Ocean. Visibilities at Los Angeles International Airport (LAX) drop to IFR conditions as the diagnosed IFR probabilities push inland. 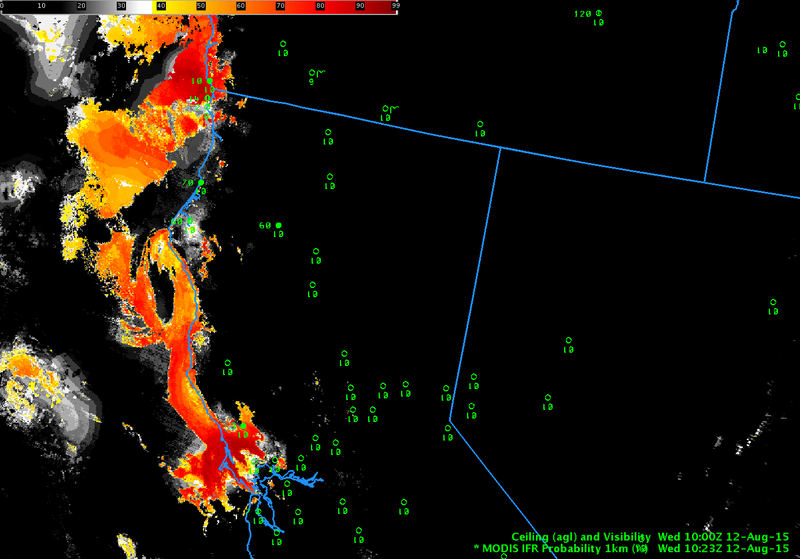 Note also the good relationship between high probabilities and low visibilities along the coast north of San Diego. There is a push inland of higher probabilities at 1000 UTC in the loop above that is not well reflected in the observations. This occurs because of stray light contamination in the brightness temperature difference channel that is obvious in the animation below. Note also how the many ‘false positives’ in the brightness temperature difference product over land in Southern California, differences that are attributable to emissivity differences in the surface, not to the presence of liquid water clouds, are effectively screened out in the GOES-R IFR Probability product. Traditional Brightness Temperature Difference product (10.7 µm – 3.9 µm) from GOES-West (mostly). Note that the ‘seam’ between GOES-East data and GOES-West data is present in the eastern part of the imagery. Hourly data from 0200 through 1400 UTC on 14 March 2013. This entry was posted in California, Stray Light on March 14, 2013 by Scott Lindstrom. Stray light occasionally intrudes into the 3.9 µm channel, and that has a big impact on both the brightness temperature difference and therefore on the GOES-R IFR product. The stray light impact on the 3.9 µm channel is evident at 0531UTC — it does not impact the 10.7 µm channel. 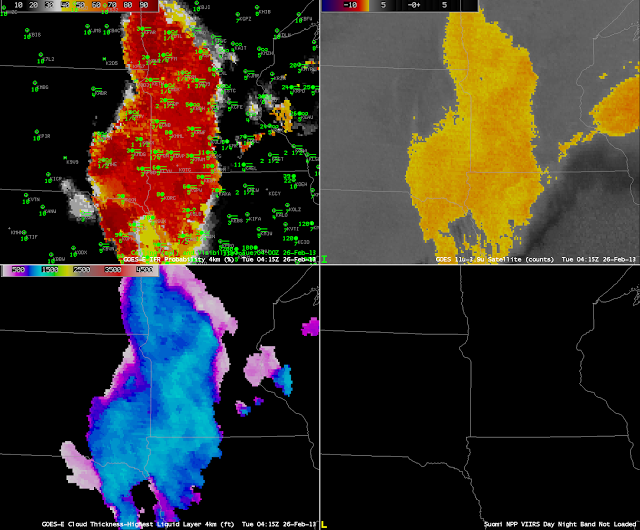 The big impact on the brightness temperature difference translates to a big signal in the GOES-R IFR probabilities. Note how GOES-R IFR probabilities do not change underneath the high-level cirrus over eastern OK, southern MO and Arkansas: GOES-R IFR probabilities do not use satellite data in regions of multiple cloud layers, or in regions of ice clouds. This entry was posted in Error Explanations, Plains, Stray Light on September 17, 2012 by Scott Lindstrom. River Valleys — sources of moisture — are nearly sub-pixel scale in GOES-East imagery. Thus, any signal that develops in a river valley will likely take time to appear, and an example of that occurred over the upper Midwest on the morning of August 6th. 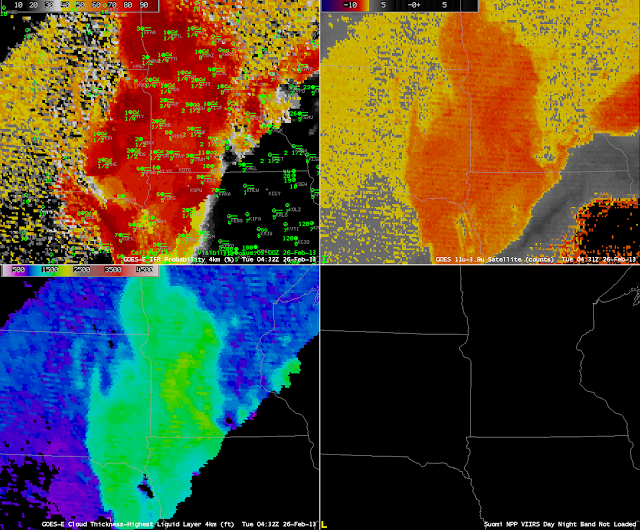 The signal develops along the river starting around 0800 — 0900 UTC (LaCrosse, WI, starts to report visibility and ceiling obstructions at 1000 UTC). There are several interesting aspects in the loop. 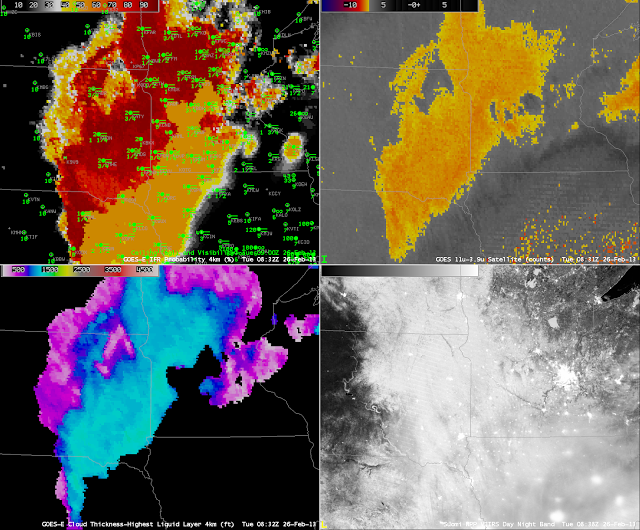 The imagery at 0502 UTC (above) shows the result of stray light contamination on the brightness temperature difference field (lower left), but this increase in signal over the Plains is ephemeral, and it is gone in 15 minutes. 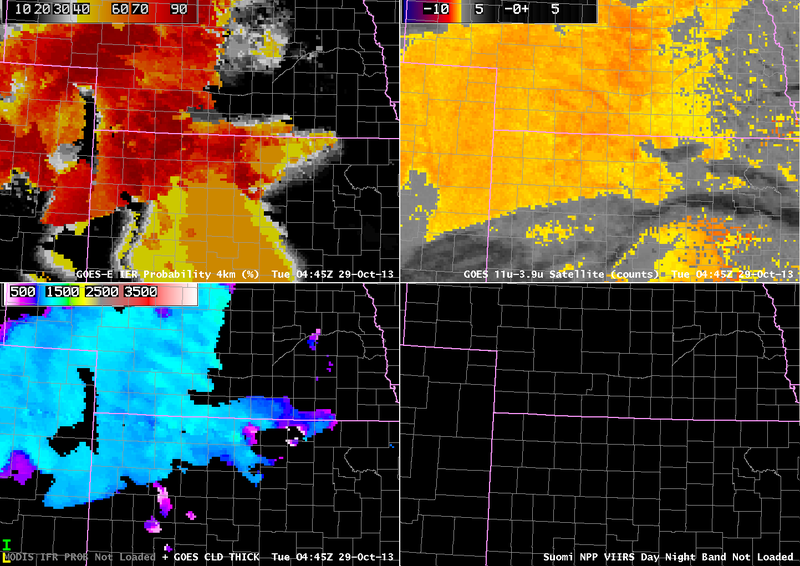 There is also an increase in the brightness temperature difference signal over the Plains as sunrise approaches. By 0915 UTC, the GOES-R IFR probabilities have increased slightly along the Wisconsin River in southwest Wisconsin, as has the brightness temperature difference signal (although that signal has increased elsewhere as well where the GOES-R IFR probabilities remain low). Compare the (relatively) low-resolution GOES-based imagery to the higher resolution Suomi/NPP resolution discussed here. Note also how the GOES-R IFR probability product correctly suppresses the IFR probabilities over Iowa and Missouri where observations show no obstructions to visibility. This entry was posted in Error Explanations, Midwest, Stray Light on August 6, 2012 by Scott Lindstrom.